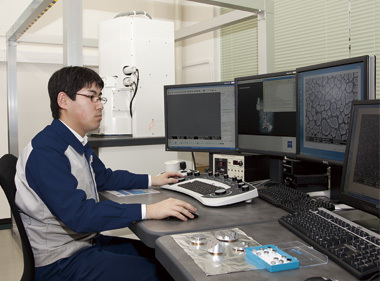 The UACJ R&D Division provides customers with optimum solutions by installing a variety of evaluation equipment and analysis devices and pursuing the optimization of comprehensive materials, surface treatment and processing. Tensile testing machines, fatigue testing machines, creep testing machines, cyclic corrosion testers, stress corrosion cracking performance test devices, etc. 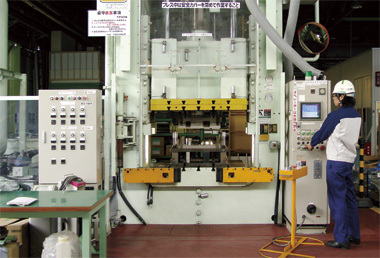 Rolling mills, extruders, large-scale presses, fin-forming devices, brazing furnaces, FSW, etc. FE-SEM, SEM-EDX, TEM, EBSP, EPMA, AFM, high-performance optical microscopes, laser microscopes, etc. Analysis of rolling, extruding, press forming, collisions, fluids, thermal conditions, solidification, dispersion, etc.